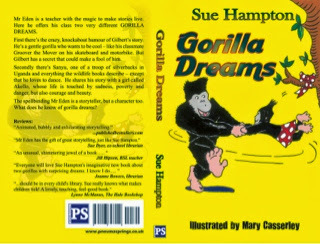 Today's guest post is by Sue Hampton about her new book GORILLA DREAMS. My Ever had GORILLA DREAMS? That’s the title of my twentieth book and it was published this week (as an e-book and paper book RRP £5.99) by PneumaSprings – one of my five publishers, and this book is a slim volume but that’s a very long story! 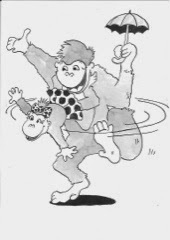 In GORILLA DREAMS Mr Eden tells two stories illustrating two styles and moods, both of which I enjoy as a writer who doesn’t want to be limited to one genre or age group. The first is wacky, cartoony slapstick fun with lots of wild, humorous imagery; the second is deeper, more sensitive and lyrical, with danger and sadness in a context that’s much more real. I value my diversity! How did I start gorilla dreaming? Well, it’s grown out of my love of dance, is dedicated to Darcey Bussell and has a few Strictly and ballet references. It’s also another way of exploring difference, a theme that in various ways underpins a lot of my work. As soon as I became Ambassador for Alopecia UK I raised over £800 by dancing non-stop for four hours. But perhaps more than anything else this book is about the power of stories – and my husband, with tongue in cheek,calls it post-modern because it has a storyteller who turns out to be a character in his own story. When I was a teacher myself I knew that Story Time was the most precious part of the school day. Subsequently as a writer I’ve seen the impact of fiction on real lives. I was invited to be Alopecia UK’s Ambassador because readers with hair loss, young and old, felt supported by my book THE WATERHOUSE GIRL. Equally movingly, it’s made readers with hair think and feel differently too. One boy wrote, “You made me a better person”. Gulp!That’s the difference stories can make. The next book will be YA, published by Candy Jar, and then in 2015 I’ll have my first actual adult novel (currently my only adult novel, ARIA, pub. Create,exists only as an e-book and audiobook) and I’m sure this range helps me to keep learning and improving. When I had my chat at Harper Collins they wanted to ‘brand’ me and I was told that my breadth was a problem that worried them! So I’m walking my own path. It’s twisted, bumpy and difficult. It sometimes feels as if it’s looped back rather than forward and I don’t kid myself that I’m heading, albeit slowly, towards J.K.Rowling status. I won’t get there. But the path has its advantages. Teachers, librarians and parents who’ve read my books appreciate the way I write: crediting kids with intelligence, extending their vocabulary, showing them a range of sentence structures and, mostimportantly, exploring timeless themes rather than following fashion. I have devoted young fans whose enjoyment keeps me writing and I love enthusing children in schools. And when I hear horror stories of big publishers trying to bully authors and take control of content, dropping titles close to publication and trying to keep the rights to the story or demand the advance back (!) I value my independence. I’ve learned a lot in seven years. I’ve become more critical of my own writing and edit much more ruthlessly. I don’t believe promises from anyone in the book world. Book shops and literary festivals rarely ring back. School mail-outs are costly and speculative, and in spite of Michael Morpurgo’s endorsement of my writing and my bargain fee, only one in 200 will book me. Customers at schools, shows or other events who say they’ll put a cheque in the post if I trust them with a signed book very often never pay. The competitions that really count are only open in practice to those with big publishers. And authors like me spend almost as much time on promotional activity as writing. 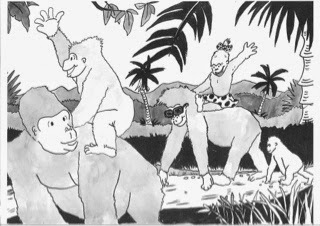 For GORILLA DREAMS I’ll be doing at least twelve school assemblies (free) and running a competition, thankfully supported by the local library with an exhibition and prize-giving, all launched at a (free) show. Heard the phrase ‘death of the author’? The Guardian recently published a piece by the Society of Authors that said publishing is no longer sustainable or equitable for writers – whose median earnings have plummeted while most publishers still make a good profit. But, to go back to GORILLA DREAMS, I’m a believer in stories, in the power of words and imagination. Children deserve good stories and I’m committed to trying to write them. I love the language and try to use it in ways that are fresh, powerful and exciting. And I’m thrilled to have a new book, beautifully illustrated by a genuine artist, to express my belief in the joy stories can bring. TWENTY books?!!! That is awesome. I know and she is such a lovely lady!